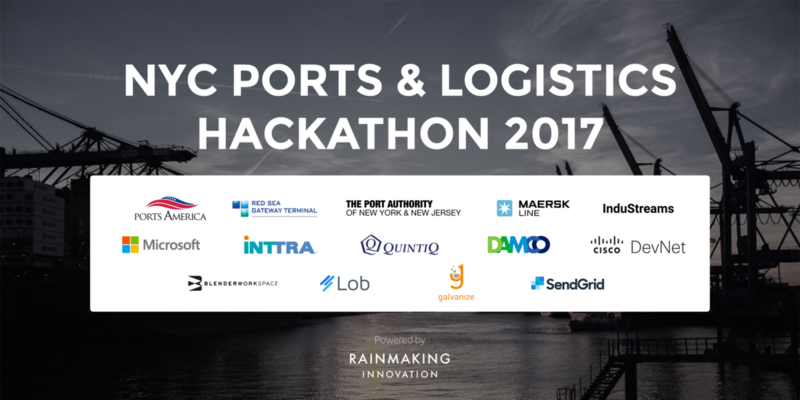 Disrupt the shipping, ports and logistics in 48 hours! Software is eating the world and there is a huge opportunity for disruption in the Shipping, Ports and Logistics industries. Join 100+ participants (developers, business people, designers, domain experts, lawyers) for 48 hours of building prototypes, rapid fire market validation and business model invention. Ports America, the Port Authority of NY/NJ, Mærsk Line, Red Sea Gateway Terminal, INTTRA, Qunitiq, DAMCO, Cisco Dev, Microsoft Azure and FMS Logistics are backing the event. The event is powered by Rainmaking Innovation. Thanks to Galvanize and Blender Workspace for proving our home for he weekend! The winning team will receive a cash prize of $5,000 and direct access to key sponsor executives to explore further opportunities. All food and drink are covered for a weekend of hacking. Just bring your laptop! All team participants must be registered on Eventbrite. Suggested team sizes are at least 4 or 5 people. All participants must be registered to Devpost. All hackathon participants must register for a ticket in advance through Eventbrite.